– At the beginning of the XXth century, Madrid had the tallest building in Europe: Telefónica. Also from there King Alfonso XII made the first Spanish call to the US, to President Calvin Coolidge. – Madrid has an Egyptian temple, called temple of Debod, a gift from the Egyptian government in gratitude for the help of Spain to save the temples of Nubia that were to be flooded with the construction of the Aswan dam. – The typical calamari sandwich emerged with the arrival of Andalusian emigrants who brought their famous fry to Madrid. – The Circulo de Bellas Artes has a statue of the goddess Minerva of 6 meters and 3,000 kg. – At the beginning of the last century, a café in Madrid was the victim of a hoax. There was a false rumor that a marchioness was bathing in cow’s milk and that the owner of the coffee bought the milk used to prepare the coffees with her. – The lampposts of the Plaza Mayor have engravings telling the events that happened there in other times. – In 1928, the prohibition of tell compliments to women in the street was decreed, with penalties of between 40 and 500 pesetas, and even imprisonment. For that reason, in some walls of Madrid they appeared painted like “Adios Vicenta, no te digo anda por miedo a las cuarentas (Goodbye Vicenta, I do not say anything to you by fear to the fortys). 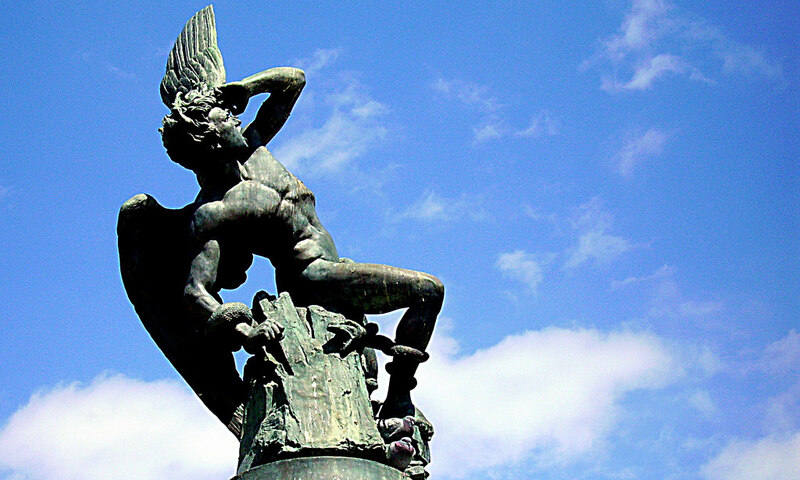 – In the Retiro Park, a statue of the devil himself is erected. It is called The Fallen Angel and curiously it is located exactly 666 meters above sea level. Well, you know, you already have a plan. To visit these curious places and then pass by El Anciano Rey to taste the delicious things we offer.